Attendance: Please be sure to call the attendance office whenever your child needs to be absent. We make every effort to call each absent student’s family within 30 minutes of the start of the school day when the absence has not been verified. Ideally, every parent would have called the office by 8am and the office staff would not have to spend the time trying to reach parents. It is critical that we reach parents who may not know that their child is not in school, so calling all absent students is time consuming. We really appreciate your timely communication. Any student who misses more than 5 days per year brings the school average down and we lose out on state dollars that we have counted on in our budget. We know that some students need to miss for medical reasons, so we need everyone else to bring our average up by attending every possible day. Thank you for helping your student be successful in school by attending every day. CAASPP Testing: Our Smarter Balanced State Testing schedule begins April 29th and continues every day through May 10th. Please avoid any unnecessary absences during these 2 weeks of testing. Students will have to be pulled from classes in order to complete any make-up testing during the following weeks. Students are encouraged to begin practicing for this test at www.caaspp.org. Eating a nutritious breakfast with protein will help students concentrate during this important testing window. Please review the special bell schedule enclosed. Graduation: 8th grade graduation is quickly approaching. The ceremony starts at 5pm on Thursday, June 6th and students need to be on campus by 4:15 in order to line up by 4:30. There are no tickets and there is no cost for the graduation ceremony. We set up 500 chairs for the families, but we always run out of seating, so please feel free to bring your own lawn chair. Graduation Dance: The graduation dance is immediately following the ceremony from 6-8:30pm and is fully supported by parents. The tickets will go on sale for $25. Parents are still needed to help chaperone, set up and clean up. Please call the office at 475-6565 and leave your name if you are available to help with the dance. 7th grade parents are encouraged to chaperone - it’s a great way to see what is involved in planning! 8th Grade Great America Trip: The Great America trip is on Monday, June 3rd this year (because high schools graduate on June 8th). 8th graders will receive permission slips the week of April 15. We only have 100 seats on the buses, so please turn in your forms ASAP. Reading: Please check your student’s AR reading progress by clicking the link on our website www.sl.losd.ca Students can log in using their username (ie; 20jstudent) and password (ie; 1234567890). This site shows what books they have read, the AR quizzes they have attempted and how many AR points they have earned toward their goal. Students should be reading 30 minutes per night. Yearbooks: Yearbooks are for sale in the office or at www.jostensyearbooks.com for $40, until May 10th. Shoreline’s Home & School Club is putting on a Music Festival on Saturday, May 4th. Several bands will be performing and there will be food for sale. Please come out to support Shoreline! Home and School Club meets one evening per month in our school library at 6:15 pm. If you are a Shoreline parent we would love to have you join! The book fair will be held April 15-19 and will be open break, lunch, after school, and during open house. 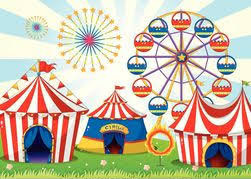 Come check out the great selection of books from Hicklebee’s Bookstore and play a few carnival games. All purchases benefit the Shoreline Library. The Shoreline community would like to thank the voters in Live Oak who continue to support our Parcel Tax. After School Sports, Music and Art are funded through the Parcel Tax. Again, thank you for all your support so we can continue to serve the students at Shoreline Middle School. Have a pic for the yearbook? - Upload it here!